I know December first is really early to be receiving a Christmas present. But when the store said they could deliver this yesterday, was I going to protest? No way! I've been hunting for a curio for some time now. 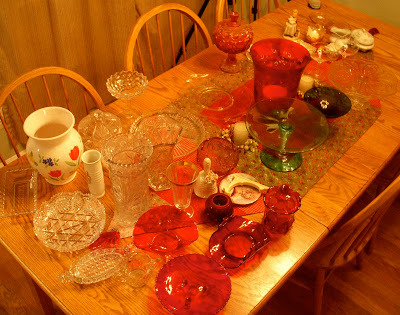 Last Friday, I was digging out Christmas decorations and once more coming across tubs of family glassware still hidden behind layers of bubble wrap. So I asked Phil if we could go to the furniture store and see if they had any good Black Friday sales. I think he knew what was coming. 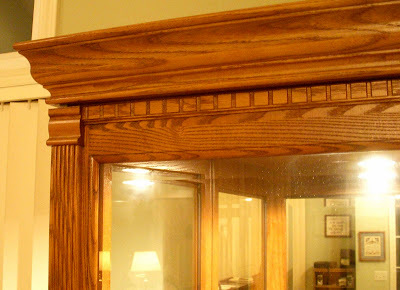 I love the dental molding and simple, classic design of the oak curio we purchased. Now I just had to figure out how to arrange all these treasures. Here's what we finally decided on. I can't tell you how thrilled I am to finally have these pieces out of storage and on display! The lighting and mirror make everything sparkle. My mother is just as excited about all this as I am, and has already offered to give me more family pieces. I so wish my grandmother were still alive to see this. She would be thrilled for me. I can hear her telling the story behind each item, and giving me advice on exactly where and how I should place it. The red shelf is my favorite. One of the pieces is Fenton glass that was a gift from my great grandmother. And the little red paperweight in the corner was always sitting on my grandfather's desk. The gold etching on this glass was done by my other grandmother, who worked at Tiffin Glass during the Depression. Her first husband died, leaving her with three small children to raise, so she went to work. Then she married my grandfather and he didn't want her to work. So she stayed home and raised my dad and uncle. 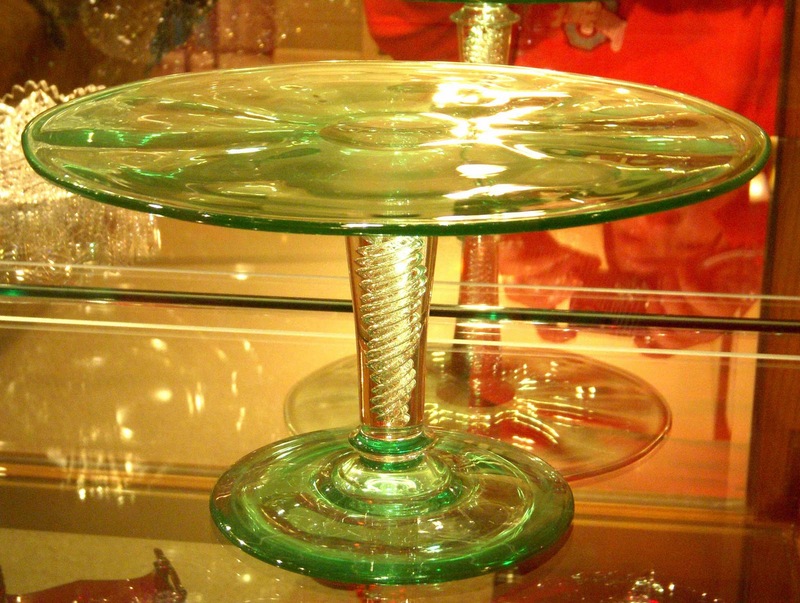 This cake plate is also Tiffin Glass, made by the husband of a dear family friend, also probably during the Depression or even earlier. It is a beautiful piece. The photo does not do it justice. 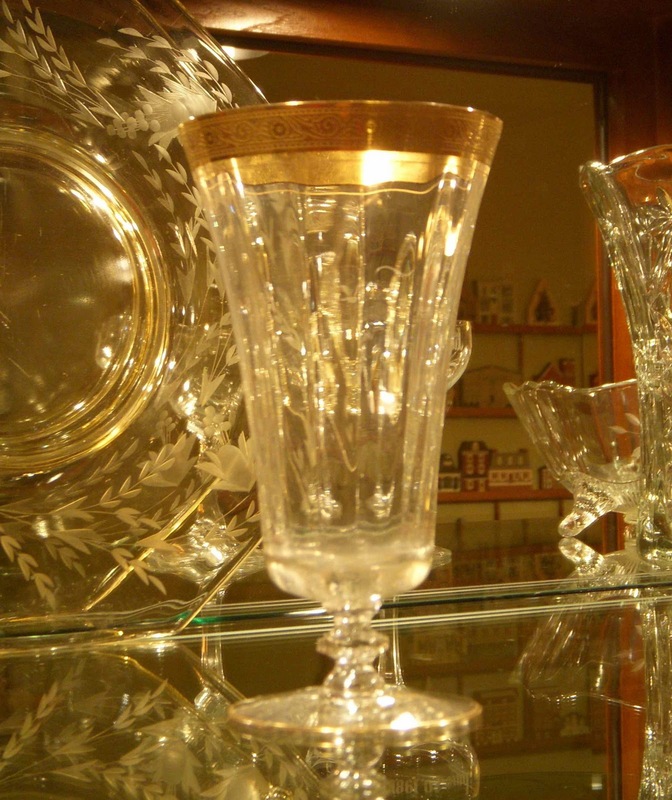 This cut glass is by far the most valuable piece in my collection, according to my mother. But I'll never sell! Thanks for indulging my little walk down memory lane and sharing my joy in such a wonderful Christmas present! Now I can enjoy it all throughout the holidays, and beyond! Don't forget, I have a nice little giveaway going on for all my followers in honor of another exciting recent event in my life. You can see all the details here. 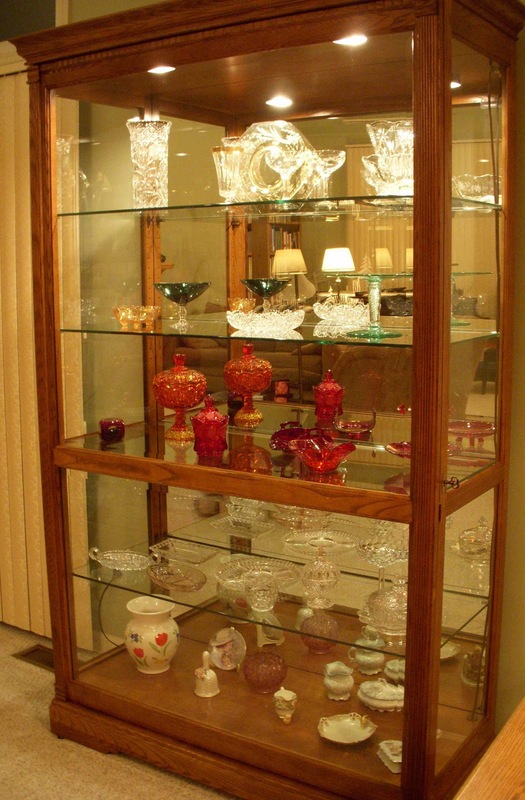 What a lovely curio and you've done a great job displaying these beautiful items! Your glass collection is stunning; but I think you are naive if you think you are done arranging. I would bet you get in there and play around some more, especially if a few more pieces come your way. The curio is really pretty, I am partial to its golden oak tones and dentil detail. It's beautiful. 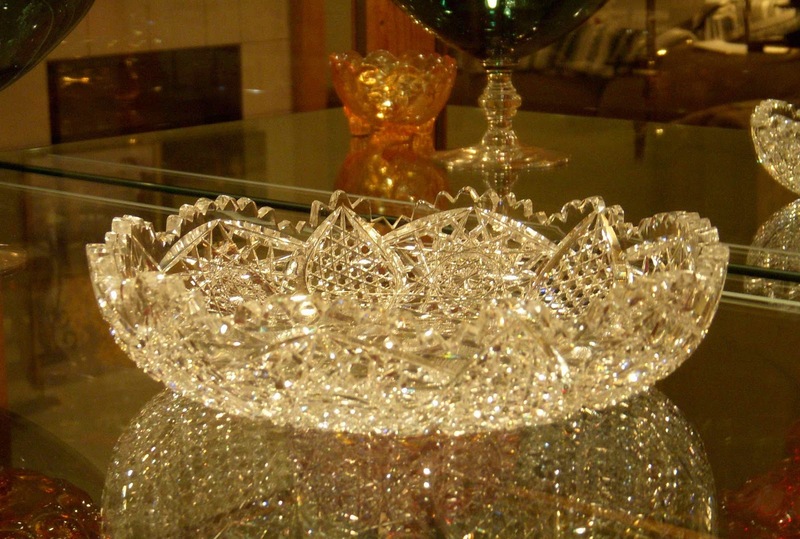 A gorgeous way to display your treasures. 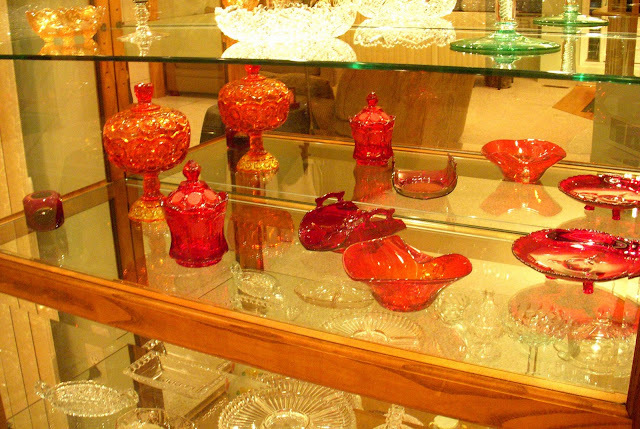 The red glass is particularly lovely! What a wonderful gift. Getting it early just means you get to enjoy it even longer. Beautiful! I love vintage glass. Your pieces are so special since they are family treasures. Thanks for sharing! Congrats on a beautiful gift! 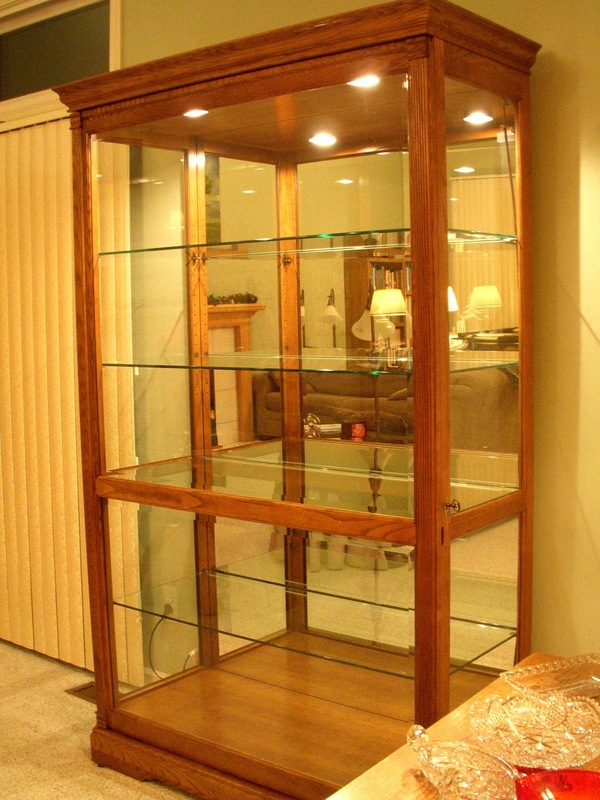 Your collection looks gorgeous in it, that's for sure. 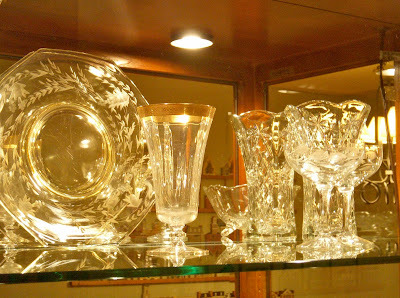 I love pieces with family stories behind them (time to scrap your glass, perhaps?). Well i loved your all this Christmas gifts collection ideas but there is something missing like personalized christmas gifts like photo mugs, photo books, photo gifts etc. would love too see your creation on all that in your next blog..